and becomes the 101st member of the 30+ club. A good weekend across the complex as the weather breaks, for a while at least. As well as some welcome rain, and boy can you hear the plants ‘drinking’ it all up, best of all we have had a welcome ‘dose of wind’ with over 48 hours of a good strong south westerly. I am not sure about the impact of the wind on the smaller lakes because the wind is not able to get much water moving due to the tree cover and limited surface area. However on Cherry Lake, with the wind blowing directly up the lake towards the house, a strong wind is able to create significant under tow. This is great, not only because it oxygenates the water, it aslo helps to turn the water over and taken some of the heat out of the water. All of which I think is good for the water and the Carp. All of our guests this weekend have been happy with some good catches. Over 20 Carp, including two twenties to 25lb have been caught from Kingfisher Lodge on Cherry Springs. The Brassington brothers, Sam and Joe, shared thirty Carp to high doubles from Cherry Pool. Even more impressive was the 2-02 Roach caught on a boilie! Cherry Lake has produced for all of our guests. 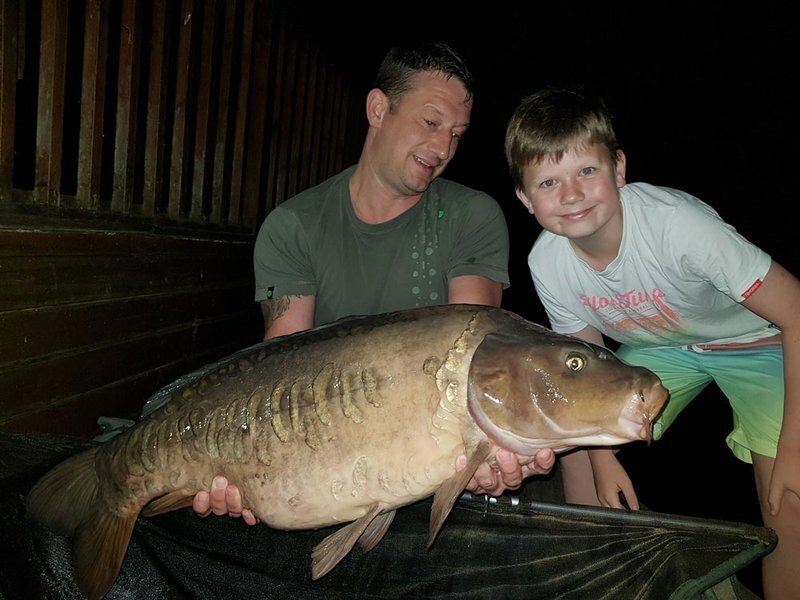 The biggest of the weekend have been caught by Vince Rolfe in Heron. Vince has been on his fourth visit to Cherry Lake this weekend with his wife Sue. He set a new PB early on Sunday morning with a stunning 28-12 Mirror. I was very pleased to see this particular fish as it is a long time since I last saw her. 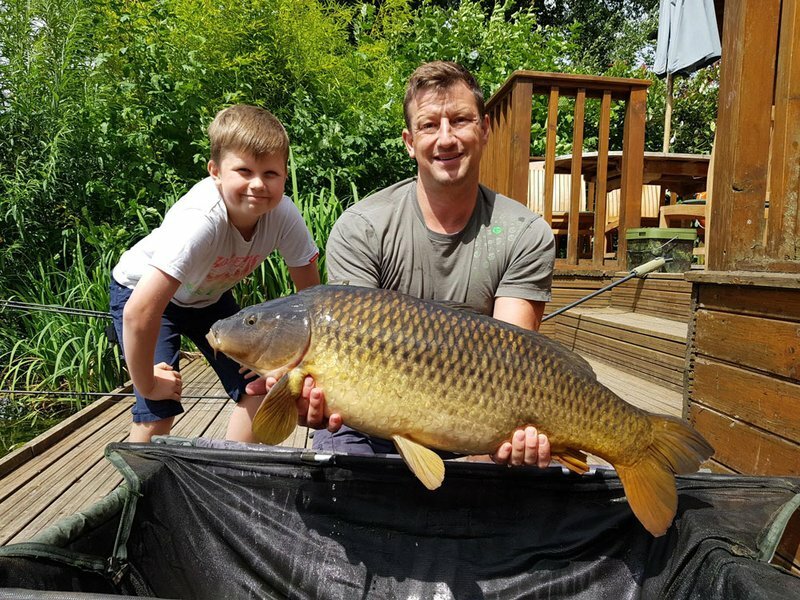 Vince followed up early on Monday morning with a second PB of his weekend when he landed a 32-02 Common. In doing so he became the 101st member of the Cherry Lakes 30+ club. Well done Vince and thoroughly deserved. Matt Howgate who stayed in Osprey Lodge landed 3 Carp, all twenties including these two pictured below. 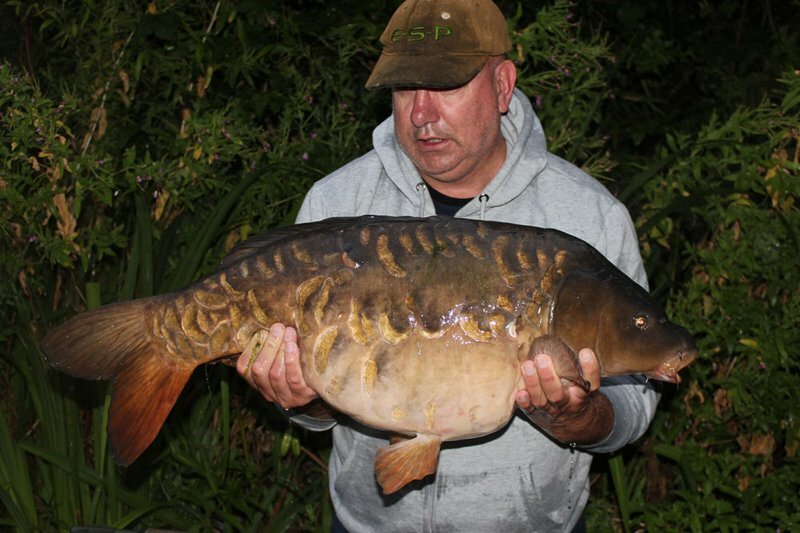 A night caught Mirror of 28-04 and a Common of 24-02. Disappointingly Matt has lost more than he has caught. My suspicion is that he was paying the price for not dropping his leads on the take. Given the weed in the lake is probably reaching its peak, the Carp know to try and get their heads down in it. If the lead is still on, it will collect some weed which changes the angle from the rod to the hook. When it does it is more likely that the barbless hook will be shed and the fish lost. The heavier the lead, the easier it is for it to be lost on the take. If you are using a baitboat then I think a 4oz lead is ideal. If the lead is only lightly locked on by the tail rubber then the lead with a heavy weight will be jettisoned 90% of the time.